This is a picture from my 2005 trip to Italy. 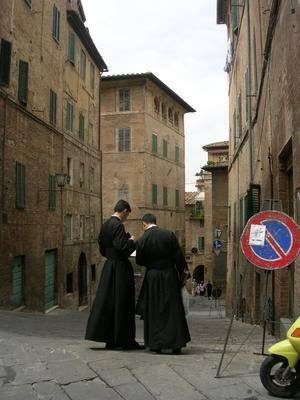 In Siena, we came across two seminarians in black cassocks trying to read a map. They were so perfectly framed by the medieval street. I keep coming back to this image as one of my favorite from the trip. Besides taking the photo quickly while their backs were turned, my friends and I chatted with these guys and gave them directions. Turns out they were actually from Minnesota. They and some other classmates were exploring Tuscany before heading to Rome for theological studies.